The teenage years are a time of tumultuous change. Our once-dependable bodies become gangly and uncoordinated. Our skin erupts with unseemly hairs and blemishes. Hormones flood our bloodstreams, inundating us with intense and unfamiliar feelings. Even our brains are in flux, making us more susceptible to accidents and addiction until they stabilize in our early 20s. Even more disturbing than the physical changes are the metaphysical ones. We leave the childhood realm of clear answers and unimpeachable authority figures and enter into murkier, more frightening territory. Stuck between youth and adulthood, we can glimpse our looming mortality without having the autonomy to realize our ambitions. 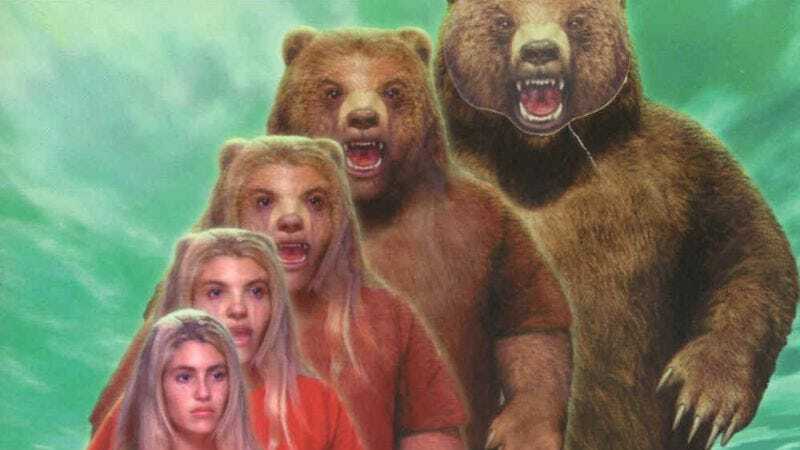 Animorphs was not the first book series to dramatize the transformative aspects of adolescence, but it stands out for its especially direct metaphor. K.A. Applegate’s young-adult series was never timid about exploiting its gimmick—namely, that there are teenagers who can turn into animals. It’s right there in the name of the series, in the flipbook at the right corner of each book’s pages, and in the iconic cover illustrations. These illustrations, which show the protagonists in the throes of transformation, convey that the metamorphoses in Animorphs aren’t the usual child-friendly changes—a pumpkin into a carriage or a mouse into a footman. No, these mutations are messy, risky, and perverse. As a kid, the shiny Animorphs paperbacks gleamed at me from the shelves of my local Borders, but for years, I steered clear of them. I was scared. There was something dangerous about these stories, a feeling emphasized by the warning on the back cover: “We can’t tell you who we are. Or where we live. It’s too risky, and we’ve got to be careful. Really careful. So we don’t trust anyone. Because if they find us… well, we just won’t let them find us. The thing you should know is that everyone is in really big trouble. Even you.” Though as a youngster I loved monster movies and gothic tales of black magic, Animorphs hit me with an unspecified dread that I couldn’t stomach—they held secrets to a shadowy world that was decidedly not for kids. Animorphs was a hit. It spanned 54 volumes, eight companion novels, two Choose Your Own Adventure-style “Alternamorphs” books, a short-lived Nickelodeon TV show, several video games, and a line of action figures. (The series even inspired at least one abysmal parody book, Vegemorphs: The Fungus Among Us.) The feeling of unease that I detected at the bookstore was crucial to Animorphs’ success. That disquiet is pervasive even in the series’ first pages. The opening chapter of The Invasion (first published in 1996) finds five adolescents walking home from the mall through an abandoned construction site. The narrator, Jake, says that this is their last moment as normal kids. Moments later, a spaceship lands, and a wounded alien imbues Jake and company with the power to absorb animals’ DNA. The extraterrestrial also tells the teens that another alien race, known as Yeerks, has already arrived on Earth and is working to enslave humanity. Creepiness abounds in the series’ signature transformations as well, because an Animorph must contend not only with a new physique, but with a new mentality. So, for example, when Jake morphs into a lizard a few chapters later, he’s overpowered by reptilian instinct and consumes a spider. The struggle to wrest control from an animal consciousness gives these passages a pleasant squirminess—I still shudder remembering a later book when the hive-mind of ants almost drives the heroes insane. Lizard-people and slugs from outer space may be spooky on their own, but what resonated most when I first read Animorphs was its less fantastical side—the isolation of our protagonists. Adolescence can be lonely, and the Animorphs spoke to this experience: They were the ultimate outsiders. It’s always Jake, Cassie, Rachel, Marco, and Tobias (and later Ax, an alien) against the world. And if that wasn’t enough, my favorite character, Tobias, is the weirdo who becomes trapped in the body of a red-tailed hawk. He’s an outsider even among outsiders. In essence, Animorphs tells the story of a group of adolescents going through changes they don’t understand, surrounded by adults who at best will never understand them and at worst will force them to conform—or kill them. The heroes know the immense magnitude of their struggles, but no one can support them. In other words, it was pitched perfectly to teenagers, who are going through the same experience on a smaller scale. That was the appeal for 13-year-old me. But how does the series hold up today, now that I’m on the Yeerk side of things? By almost any standard, these books are garbage. Each was written in about three weeks—many by ghostwriters—and the seams show. The prose is silly (“Rachel may look like Miss Teen Model or whatever, but she thinks she’s Storm from the X-Men,”). Characters are painted in broad brushstrokes: Rachel is a fighter, Cassie is compassionate, Marco tells jokes. And plot twists are telegraphed early and often. Perhaps worst—and most teenaged—of all, the books are bogged down with angst. Though I’m sure this appealed to me at one time, I’m no longer enthralled by the continuous gnashing of teeth over Yeerk-infested family members, the weight of responsibility on their shoulders, and the hopelessness of their fight. I want to take these guys aside and tell them not to take themselves so seriously. Despite its shortcomings, something about Animorphs still thrills. Indeed, its flaws even serve to heighten its power in a strange way—lending the series a visceral, on-the-run energy. I reread the first couple entries in no time and was eager to discover what happened next. The battles are fast-paced and varied enough to feel fresh. The entry into a new animal form is invariably captivating, and an ever-expanding sci-fi universe rewards long-term readers. Above all, these books are imaginative, adventurous fun, and I still respond to that as an adult—perhaps because it’s comforting to know that no matter how much we change, some things remain the same.